Derek “The Surgeon” Silveira beat Roberto “Viejo” Valenzuela Jr. via an eight-round unanimous decision (79-71, 79-73, and 78-72) to reclaim the vacant New England welterweight champion. Valenzuela controlled the first-round until Silveira connected on a hard straight left that knocked down Valenzuela at the end of the round. Valenzuela was really stunned from this punch because he took the second-round off as he tried to regain his senses. Silveira continued to outwork, and out-land Valenzuela, and he connected on the harder punches over the next three rounds as Valenzuela did not do much of anything offensively. Valenzuela drastically picked up his offensive output in the sixth-round as he aggressively chased Silveira around the ring and connected on several hard combinations. He knocked down Silveira but it was correctly ruled a slip. In the seventh, Valenzuela connected on a punch that was below the belt line that caused Silveira to drop to the canvas in excruciating pain. Silveira was given five minutes to recover from the low punch, and he used all the allotted time. After the break, Silveira displayed an effective jab and counter punching while Valenzuela connected on more hard shots. In the eighth-round, Valenzuela knew that he needed a knockout to win and came close to doing just that. He knocked down Silveira in the middle of the round from a right hook and was extremely close to knocking down Silveira on several other occasions, but Silveira hung in there and did not go down again. Silveira improved to 16-2, 8 KOs. He has won three in a row. He also beat Valenzuela’s father, Roberto via a second-round knockout two years ago. Valenzuela, who is just nineteen-years-old, dropped to 14-1, 13 KOs. He took the fight on two weeks notice after Travis Demko got injured during training camp and had to withdraw from the bout. This eleven-bout fight card, “Riot at the Rim” was promoted by Granite Chin Promotions from The Rim in Hampton, New Hampshire. The promoter, New England cruiserweight titleholder, Chris Traietti (27-4, 21 KOs) was supposed to fight Gilberto “El Magico” Matheus Domingos (22-10, 20 KOs) on this fight card for the vacant WBC FECARBOX cruiserweight title, however, Domingos was unable to enter the United States to fight due to visa issues, so the bout was canceled. Romain Tomas scored a mild upset over Omar “The Beast” Bordoy, in the co-feature, via a sixth-round split decision (59-55 and 58-56 for Tomas and 58-56 for Bordoy). This was an extremely competitive, back-and-forth welterweight fight but most individuals at ringside believed that Bordoy had done enough to win. Both fighters landed effective combinations, but Bordoy connected on the harder shots and was the more active fighter. Tomas improved to 8-2, 1 KOs. Bordoy dropped to 7-1, 2 KOs. Khiry “TNT” Todd knocked down Francisco “El Mono” Medal three times in the first-round from body shots, which prompted referee, Mike Ryan to waive off the one-sided welterweight bout at one minute, thirty seconds. Todd improved to 8-1, 6 KOs with the technical knockout win. He got back in the win column following his sixth-round majority loss to undefeated Adrian Sosa. Medal fell to 13-17, 8 KOs. Highly regarded featherweight contender, Tramaine “The Mighty Midget” Williams cruised to an eight-round unanimous decision (80-72, 80-72, and 78-74) over Ernesto “Monito” Guerrero. The ten-time National Amateur champion displayed hard jabs and combinations as he outworked Guerrero and great defense that prevented Guerrero from getting into any kind of offensive rhythm. Williams upped his record to 17-0, 6 KOs in his second fight after being out of the sport for a year. He will probably be back in the ring in June as he works his way towards a world title fight by the end of the year. Guerrero fell to 31-27, 21 KOs. “Handsome” Henry Gedney, the winner of the 2017 Rocky Marciano Tournament, defeated Roberto “El Viejo” Valenzuela via a fourth-round technical knockout as referee, Leo Gerstel stopped the one-sided bout at one minute, fifty-three seconds. Gedney improved to 3-0, 2 KOs. Valenzuela dropped to 67-79-2, 56 KOs. Gedney dominated this middleweight bout as he landed whatever he wanted including several hard body shots. Valenzuela did not throw many punches as he was content to cover up. 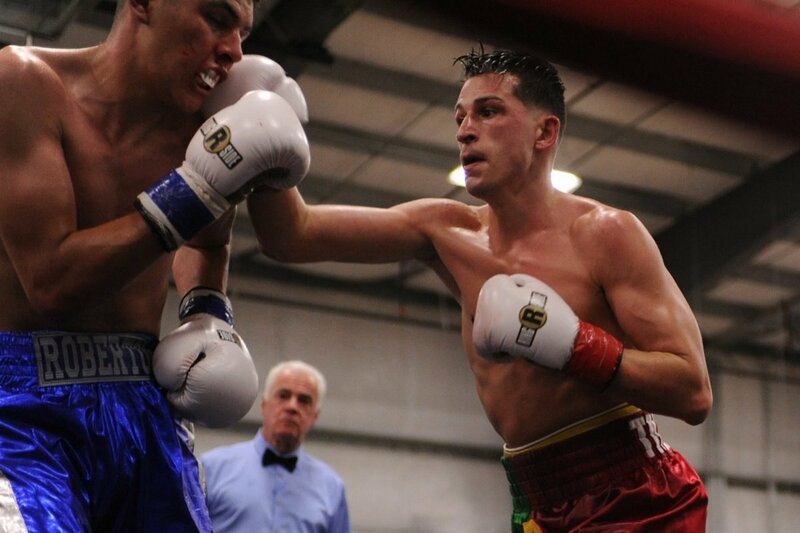 Undefeated IBA Americas welterweight champion, Anthony “A1” Marsella Jr. scored two knockdowns over Engleberto “Guarura” Valenzuela in the first-round after which referee, Ryan stopped the welterweight bout at one minute, nineteen seconds. Marsella scored the knockdowns from a right hook, left hook, respectively. Marsella upped his record to 12-0, 6 KOs. Valenzuela fell to 11-16, 3 KOs. Junior welterweight, Nelson Perez had a successful professional debut (1-0, 1 KO), as he scored a first-round knockout over Emmerson Noguiera, who was also making his pro debut (0-1), via a hard right hook to the body at one minute, seventeen seconds. Andy Aiello and Sidney “Keelo” Maccow waged an exciting, action-packed six round junior welterweight bout in which Maccow won every round on all three scorecards (60-53, 60-54, and 60-54). Maccow landed more punches, better combinations, and harder shots. He badly staggered Aiello a couple of times in the third round. Maccow improved to 6-8, 3 KOs. He has won two in a row. He will be back in the ring on June 14th at the Worcester Palladium. Aiello demonstrated a lot of heart by fighting hard the entire bout despite taking a great deal of punishment. He dropped to 1-3-1. 2017 New England Golden Gloves Champion and Most Outstanding Boxer of the tournament, Nathan Martinez annihilated Chantae “Malik” Bowens with a first-round knockout victory. He pummeled Bowens around the ring and then knocked him down via a powerful left hook. Referee, Gerstel quickly waived off the featherweight fight at one minute, three seconds. Martinez, who is only twenty-years-old, kept his undefeated record intact (3-0, 1 KO). Bowens fell to 0-2. WBC Latino cruiserweight champion, Vinnie “American Nightmare” Carita made quick work of Claudio “Quexada” Porto with a crushing first-round knockout victory via a powerful right hook to the body at two minutes, thirty-seven seconds. With the knockout victory, Carita won the vacant ABF Continental Americas cruiserweight championship. Porto did not attempt to beat the ten-count. He remained on the canvas for several minutes before he walked off on his own power. Carita improved to 20-1-1, 18 KOs. He has won sixteen in a row. Porto fell to 8-5-1, 7 KOs. Rob Butler won his professional debut (1-0) as he scored a dominating fourth-round unanimous decision (40-36, 40-36, and 39-37) over Rodrigo Almeida. Butler outworked and out-landed Almeida throughout their middleweight bout. Almeida dropped to 1-10.